My girls came up with some creative ways to wrap presents this year using things we had around the house. 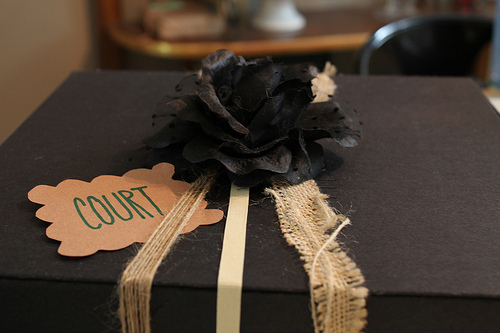 They found a way to re-purpose everything from Trader Joe’s paper bags to flower hair clips! I thought I’d show ’em off today! 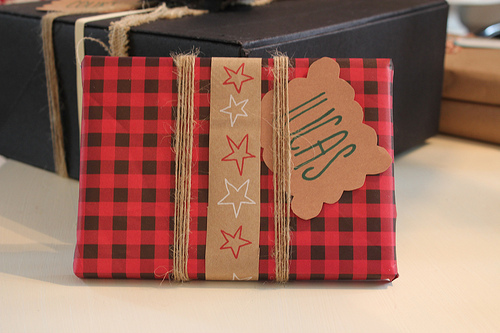 Even though Christmas is over, these ideas might jump start your creativity when wrapping gifts down the road for any occasion. I don’t know about you, but we are pretty much still in holiday mode around here. Other than putting together a Christmas eve service for church, we’ve been staying in our jammies all day, eating too much, watching movies, sitting by the fire, chasing Jack around. My kids have all been home and it has been so wonderful to just hang out together! I wish it could stay this way forever. My niece and nephew are coming tomorrow so the festivities will continue! Yesterday we still kept our jammies on all day (which might actually be because we’ve eaten too much pie and we need elastic waist bands), but started a new room makeover project I can talk about in the next few days. And very soon I’ll be recapping my 2011 home projects! I will also catch up on photos I haven’t showed you, including afters of the bathroom project, progress reports on my entry, a new fireplace mantel, new light fixtures, and updates on the swine paint elimination progress! Yahoo, I have a lot of new things to share! But, for now, I’m going to keep hanging out in my jammies with my family by the fire. 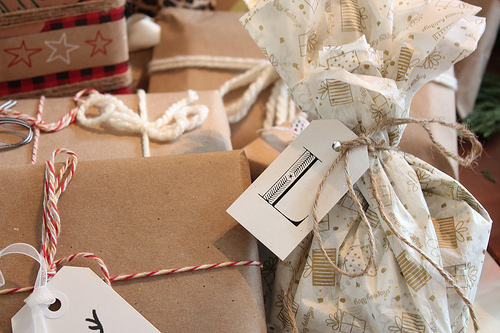 Meanwhile, enjoy these creative gift wrap ideas — even more importantly, savor the last week of the holiday break! 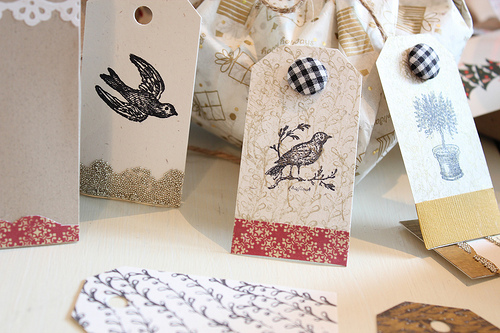 Download a free set of hand drawn Woodland Animal Gift Tags! 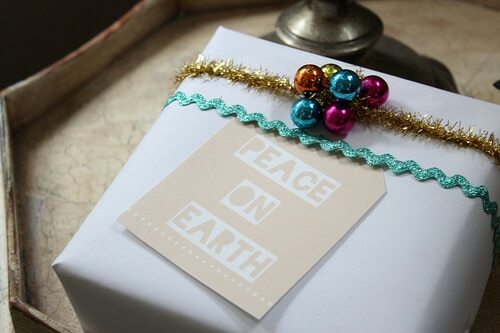 Download a free set of Peace on Earth gift tags! 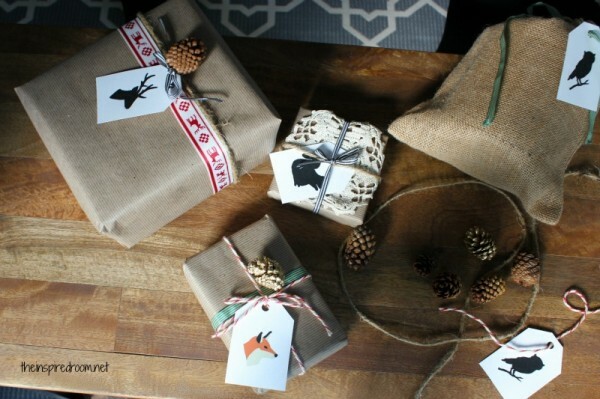 As I toss ANOTHER bag of torn and shredded purchased gift wrap into the recycling bin, this idea of making your own paper struck a nerve. Great idea and one I’ll be planning on for next year. Hope you are still in your pjs today. I like it. And I can’t wait to see your new projects. 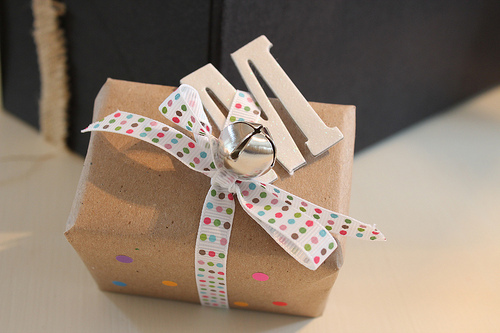 Very cute wrapping! The season felt like it went really fast this year, so I think I’ll just relax for the next week too, too soon it’ll all be done : ( can’t wait for all you have to share with us! Very pretty! 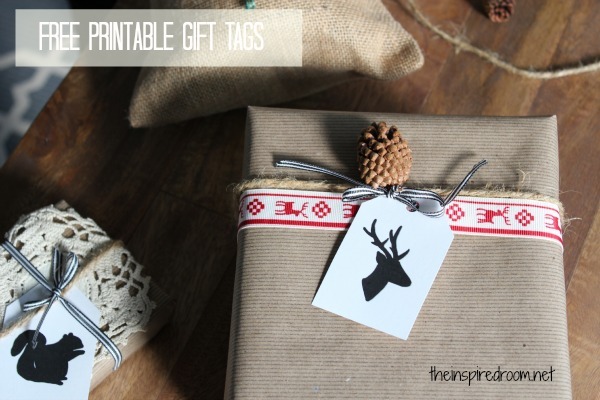 I especially like the stag head gift tag. Where did that one come from? That tag was hand drawn. The rest were stamped! Of course I would want the hand drawn one! ha! Each year you and your girls come up with some pretty creative wrap. My favorite is the ‘buffalo check.’ Great ideas for sure! I’ve gotta get me some of that bakers’ twine. I so love red and white. 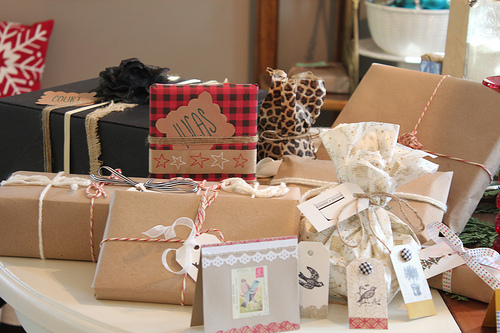 The birds are from rubber stamps, the deer were hand drawn. Where did you find the thick baker’s twine? I’m having trouble finding twine that will look good on larger packages. Most of it is very thin. I’m glad your Christmas was so lovely! I loved having all my girls home for the week! You have some great thrifty ideas there. 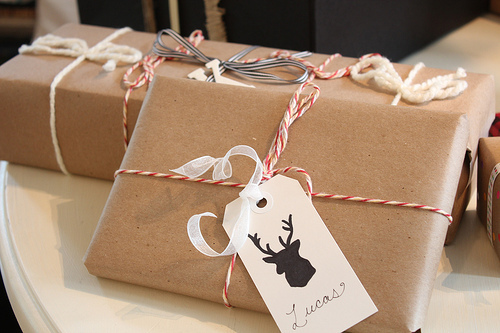 My favourite way to wrap a present is using brown kraft paper and then yarn. I started doing this when I rescued some leftover wool my mother was decluttering and realized I love the look of wool wound around a present – so homey!